When selecting fresh lychees, be aware that the term "nut" refers to the entire fruit. From the outside in, this includes the red husk, the white flesh and the brown seed. Of these three layers, only the fruit is edible. The red husk is bitter and tough. While some cultures ingest the brown seed to aid in digestion, this portion of the fruit can have a purgative effect. What does a lychee look like? A lychee seed looks like a large raspberry. Lychees have a texture similar to grapes and a sweet flavor of citrus with a hint of rose water. They can be canned, eaten fresh or dried into a flavorful resin such as lychee fruit belts. On a flavor scale of 1 to 10, lychees get an 8 for sweetness. The beautiful white flesh of these fruits has a pearly sheen to them, and they smell slightly of roses. Lychees get 4 out of 10 for tartness. They are not unpleasantly sour unless under-ripe, but they pair beautifully with citrus fruits such as lime and add complexity of flavor to drinks and desserts. If you note a whiff of fermentation, the lychees are spoiled. Do not eat them. Lychees are not naturally salty. However, this fruit has a robust enough flavor that it can tolerate some salt in combination, such as when combining it with cheese. Properly harvested lychees should register 0 out of 10 for bitterness. Unripened lychees are bitter and unpleasantly sour. If possible, check the husks. They should be raspberry red. If not, avoid them. Lychees taste a bit like the smell of a rose, approximately 3 out of 10 on the flavor scale. If you've never enjoyed this flavor before, find an Asian grocery that sells bottled rose water and add a splash of it to a glass of lemonade. What Is Lychee? Where Do Lychees Grow? Where do lychees come from? Lychee fruits are a seed grown on the lychee tree, a tropical evergreen found in China and India. If you live in agricultural zone 10 or 11 and have no risk of frost, you may be able to grow lychees in your own landscape. There are many types of lychee that have been developed for landscape cultivation, though you'll need to avoid standing water. The lychee tree will bear usable fruit after only a few years. When planting the tree, be sure to find a sheltered location; lychee trees grow in a dense umbrella pattern, so strong winds can damage and even topple this tree. Is lychee a fruit? The whole red berry is indeed a fruit, though the skin and seed are not edible. To harvest lychee fruits, let them ripen on the tree. If you pick them green, they won't ripen. The lychee berry will be bright red when ripe. They must by manually cut away from the tree. Once harvested, fresh lychee fruits can be stored for up to two weeks, dried or canned. The red husk must be cut away before eating; the white pearly flesh is your reward! Please note that lychee will ferment over time. If you can find a source for fresh lychee, let your nose guide your decisions as to their edibility. The tang of fermentation should be avoided when purchasing lychee fruit. Fresh lychees can be a challenge to locate, but these beautiful fruits can often be found canned. A word of warning: canned lychee has an appearance similar to white grapes in fruit cocktail. The flavor is markedly different from grapes and has a hint of rose. Canned lychee is quite popular in fruit salads and can even be blended into sorbets and ice cream. Bartenders are building a fan base of the lychee fruit with lychee martinis! The fruit combines well with other tropical fruits including coconut and lime. Fresh lychees pair well with cheese; Hawaiian recipes for fresh lychees include stuffing them with a mild cream cheese. Other options include adding a bit of spice with a gorgonzola blend. To serve fresh lychee, you need to get the husk off and remove the seed. Be sure to purchase red lychee; as previously stated, this fruit doesn't ripen any further once it's taken from the tree. Brush it gently with your fingertips near the seam. The peel should split and come off in just a few pieces. Open the fruit to remove the seed. Experts with Cooking on the Weekends recommend taking the seed only; there is a brown paper husk inside the fruit that should not be removed. The aroma of your fresh lychee will be quite strong. The intense flavor qualities of this fruit make it easy to pair with dairy or alcohol. It can be eaten raw, blended into a lychee drink, or dried. Dried lychee resembles a raisin, but offers a richer flavor. When purchasing canned lychee, try to find a food producer that doesn't use a lot of sugar in the canning process. This fruit has an intense and deep flavor, so producers will often can it with heavy syrup to try to balance the flavor. Lychee calories come primarily from simple sugars; you don't want added sugars as well. Per nutritional data collected from the USDA, one of the lychee benefits is that they are quite high in vitamin C and potassium. One cup of fresh or no sugar added canned lychee will give you 10% of your daily fiber needs. As previously stated, it is wise to avoid lychee seeds. Also avoid eating unripened lychees. Not only will they taste bitter and unpleasantly sour, but you will have just ingested a most unpleasant purgative. Dried lychee fruit and dried lychee nuts refer to the same dried flesh. If you find lychee seeds available as a nutritional supplement, regard them with suspicion. When working out how to tell if lychee is bad, remember that fresh lychees don't soften and spoil or rot as many fruits do. Instead, they ferment. If you are lucky enough to find a source of fresh lychees, sniff them. The tang of fermentation is quite obvious. Do not eat lychee nuts that have begun the fermentation process. Lychee fruit benefits are best eaten in small batches because ten lychees offer as much vitamin C as one orange! If you're trying to boost your dietary intake of vitamins and minerals (as opposed to getting them from supplements) be aware that lychees are also quite high in fiber. For those trying to increase their fiber intake, it's important to go slowly and let the body adjust to new levels of fiber in the gut. A final note: the brown seed at the center of the lychee should not be eaten. While it's not technically poisonous, your body will likely reject it. There are several tropical fruits similar to lychee, but each has its own similar flavor and texture. It's important to consider each of these treats as its own item; for example, while raspberries and strawberries are both red berries, each offers a unique and delicious taste. It's important to note that once lychee, rambutan and longan are exposed to alcohol, their unique flavor qualities disappear. Only by studying the original shell can you really tell the difference between the fruits once they're part of a cocktail. Fruits with a similar growing habit to lychee are rambutan and longan. While the growth habit and structure may be similar, the fruits themselves are quite different. 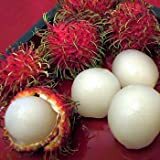 Similarities: Both the rambutan and lychee have an inedible outer shell, inner brown seed. The outer shell of the longan is a yellow brown, not red. Even when ripe, longans are much tarter than lychee fruits. If you find the sweetness of the lychee off-putting, the longan may be ideal for you. The longan is also called the Dragon Eye Fruit. The outer shell of the rambutan is red, but it's also spiky or hairy. Rambutans are a bit larger than lychees and have a firmer flesh. The flavor is a bit creamier; this is an ideal fruit to pair with mild cheeses. It's important to dig into these delicious and unique foods. Too often the western palate dismisses unique foods, flavors and textures from around the world because a certain item "tastes odd" or "tastes like". Diners really miss out on wonderful and subtle flavor differences when they dismiss items just because they're new. It's also important to note that, in the case of canned lychees, each manufacturer may put their own spin on the product via processing technique or flavor additive. If you hate canned lychees, try another brand before dismissing all of this unique and refreshing fruit. World cuisines are mixing and blending quickly, and this is wonderful! Lychees can be enjoyed fresh or canned and are a great addition to desserts, salads and beverages. If you've never tasted fresh lychees before but can't be certain of your source, try the canned variety. Prepare yourself for a floral flavor; this is a unique taste for many in the developed world. Go easy on your first can of lychees until how you know your body will respond to this high fiber food. If you’re a fan of lychee, let us know in the comments with your favorite tips and recipes. It would definitely help out fellow foodies! If you haven’t has the pleasure of eating this delicious fruit, what’s holding you back? Does Oatmeal Go Bad? How Long Does It Last?